Join the discussion on our forums! 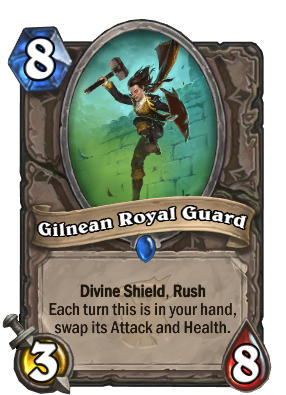 Come discuss Gilnean Royal Guard over in our dedicated Gilnean Royal Guard discussion topic. swap its Attack and Health. Admittedly, they kind of dropped the ball with Prince Liam. Corpsetaker can take advantage of its effect on this type of deck too. Lady in White synergy incoming. Easily the best shifter. Still gonna see zero play in standard... Mayyyyyyyybe rush Warrior? They said they were pushing that archetype right? I am curious of how they will call the effect of: "Each turn this is in your hand, swap its Attack and Health." in the next expansion. they started the lifesteal thing with Mistress of Pain but just named it like that a couple of expansions later. The same with Charge. So why not? This effect is not even yet in play and you think it will fade out? I am not so sure about that. Normally Blizzard is doing what they like and not what the community asks for. Man I really love the card art. Can't see this being played in constructed, but is a good arena card. 8 mana deal 8 summon an 8/3 is really good, and deal 3 summon a 3/8 is not terrible. DIE GIANT!!! ...wait, what turn is it? Oh...DIE SHAMAN TOTEM!!! It will be really appreciated in arena. Versatile minion with huge HP to stick for next turn or big threat removal as a rare minion? IMO sounds good. Probably the best of the "Worgen" cards so far. But still not very impressive. Too expensive. Too "Meh". Awesome arena card. Like actually incredible. Pack filler until Un'Goro rotates. Charged Devilsaur fills the niche this card would otherwise provide in recruit decks and can also go face when recruited. Ehh... no.. without a card like lady in white this card is pretty bad due to it's mana cost and the fact you want the 8/3 body more than the 3/8 body almost all the time since rag isn't a thing anymore and there aren't any big minions this one can kill atmthat are being played. 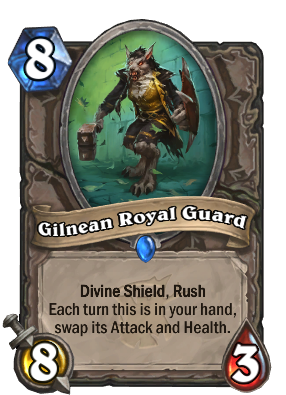 it's a "fair" card but it's not to good it's... pretty much king krush and that doesn't see play and king krush can go face and is an 8/8 this minion is as if you used King krush to hit a 6 drop.... and idk why anyone would wana play a 8 mana 3/8 with divine shield, no taunt and rush. almost all of the cards are good in arena. this card of course is great in arena. but most of what i mention is strictly Standard stuff since i don't really play Arena. 8/3 Rush Divine shield for a pretty good trade. Or 3/8 kill a small/damaged minion and then give her a taunt.